Can anyone tell us more about these arm badges? In connection with my research into the London & North Western and Great Western Railways Joint Committee at Shrewsbury, I have found a reference to outside porters. I quote minute no. 15012, from the Joint Officers' Conference Printed Minutes, page 5545, date not recorded but c.1901 or thereabouts. 15012. OUT-DOOR PORTERS, SHREWSBURY. Mr. Thorne reported that the number of out-side porters at Shrewsbury had been increased from four to seven. From memory, in ‘A Short History of Shrewsbury Station’ by John Horsley Denton, 1986, mention is made of outside porters paying 6d. in rent, presumably to the Joint Committee, but over what period is not clear, possibly monthly. My impression is that the outside porters in this case were self-employed hence the rent paid, in a similar way that cab-men paid rent to ply their trade from the station. 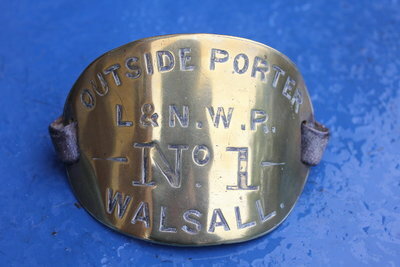 In which case, outside porters would not have uniforms, only an arm badge to show that they were authorised by the railway company. The work of outdoor porters I assume, would be to transport passengers luggage etc, to hotels, shops, other commercial premises and to houses. While not directly answering the query, searches of some of the online archives of nineteenth century newspapers (in this instance the archive of papers printed in Wales provided by the National Library of Wales - http://newspapers.library.wales/ ) - can provide some background information on portering issues, and possibly on the use of the type of badge shown in this photograph. Being a ‘Town Porter’ seems to have provided a steady, if not spectacular income. One who became bankrupt for other reasons said he made between £65 and £75 annually from the work, but ‘ out of this he had to keep a pony and pay for stabling,’ (Caernarfon & Denbigh Herald 16th January 1903). In 1907 there was something of a sensation when two of the porters spent the off-season in America, and proposed to take their families with them next time. (Rhyl Journal, 27th May 1907, p.2). There was, though, a bone of contention; ‘several town porters had compained that certain privileges were extended to a few, to the exclusion of all the others. He understood that the grievance was that certain men were licenced by the Railway Company as well as by the Council, and he wondered if the Council could do anything to adjust the grievance. The Chairman-“I take it that you are referring to the permits to go on to the railway platform which are allowed to two or three of the men.” Mr Batho “Can we do anything in the matter?” The Chairman “I don‘t think we can. It is in the hands of the Railway Company entirely.” Mr Batho “The complaint is that this system has created a monopoly for two or three.” The Chairman “It is not the fault of the Council.” The Town Clerk “We have tried to do something, but could not.” Mr Winterbottom “If Mr Batho knows the facts I don‘ t think he will press the matter any further. If those who consider they have a grievance come up to the standard of those who enjoy the privilege extended by the Railway Company, there will be no cause for complaint.” The discussion then dropped.‘ (Rhyl Journal, 27th May 1907, p.2). The following year matters seem to have escalated, and the L&NWR brought a case in the magistrates court against four ‘town porters’.at the Rhyl Police Court, for touting for employment at the entrance to the railway station. ‘The men held the Urban District Council‘s licences as town porters, and earned their living by carting luggage for people coming into the town, but the Railway Company did not permit them to go upon the station premises, though they were allowed to enter the station approach. The Company provided their own porters, and also licensed porters who were not on the station staff, but were allowed to take luggage from the platforms to the town. The defendants stood outside the station more or less all day, and they often obstructed the exit.’ (Rhyl Journal, 18th July 1908, p.9). During the course of proceedings, the defendants claimed the arrangements at Rhyl were unfair ‘ At Colwyn Bay and Llandudno the Railway Company had rules under which the men had stands and were permitted to take engagements in rotation Why should not a similar custom prevail at Rhyl?’ They also alleged that ‘ one man, named as Edward Hughes, was engaged by the Railway Company as outside porter, and had a monopoly of the luggage traffic.’ (Rhyl Journal, 18th July 1908, p.9). This sheds some light on the microeconomics of portering in the early twentieth century, but may also be relevant to the subject of mystery photograph 200. It is clear that at Rhyl, and presumably other stations along the North Wales coast as well, most ‘outside porters’ were not directly employed by the L&NWR. At Rhyl, though, the railway company gave permits to at least one town/outside porter who was not in their employ to access the platforms. Presumably some form of identity would be required to gain access, but whether this accounts for the type of badge in photograph 200 is difficult to say. Outside (badge) porters are mentioned frequently in the minutes of the LNWR Officers' Conference (just as they are in the GW & LNW Joint Officers' Conference, or JOC). At each monthly meeting there is a report about arrangements for Parcels Agents, cab hire, bill posters and outside porters. These were all self-employed, not LNWR staff, but either permitted, or paid, to perform one or other service. In at least 50% of these reports there is some mention of an outside ported appointed or resigned. For example, here are two minutes taken from 1887: 19 April 87 minute 29425 - BANGOR. William Ormrod to be appointed Out-door porter (No.4). A badge to be supplied, The usual fee of 1s has been paid. 13 July 87 minute 29513 - BATLEY. Alfred Johnson has been appointed Out-door porter and a badge supplied to him. Wednesbury and Morecambe are also mentioned in other minutes that year. By reading all the minutes over a period of (say) 25-30 years, perhaps from 1887 until 1914, it would be theoretically possible to identify all the places where these outdoor porters were appointed, with numbers and possibly even names. It would not be too hard to do this as the relevant minutes can very quickly be identified in each of the 11 meetings per year (no meeting in September). Does anyone have some spare time to do this? The minutes for 1887-94 and 1899-1906 are at the Study Centre, others are only held at TNA but have been photographed. They are not included in LNWR staff records as they were not employees. So in theory we ought to know where, how many and who. Thanks to David's newspaper extracts above we also have a good idea what and how.